Image ©2015 by TheMartiniDiva.Com. All Rights Reserved. No permission given to copy, distribute, share, print or reproduce without prior licensing agreement. 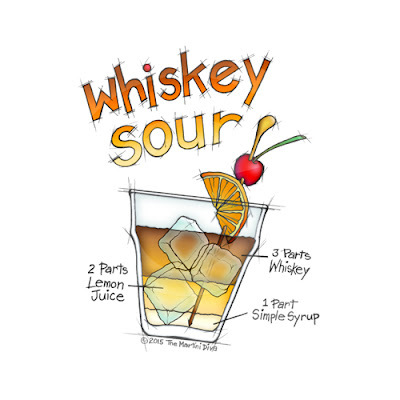 Most likely descended from vintage punch recipes that followed the ratios of 1 strong (spirits), 2 sweet (sugars, sweeteners), 3 Sour (citrus, acidic elements), 4 weak (water, ice or mixers), the Whiskey Sour is one of the earliest of the sour family of cocktails. Kind of a great uncle to other sours like Margaritas, Daiquiris, the Aviation and the Sidecar, it is a much aligned cocktail that has suffered badly from lazy versions that employ bottled sour mixes instead of the fresh lemon juice and sugar/simple syrup called for in original recipes. "1 large tea-spoonful of powdered white sugar dissolved in a little Seltzer or Apollinaris water. The juice of half a small lemon. 1 wine-glass of Bourbon or rye whiskey. Fill the glass full of shaved ice, shake up and strain into a claret glass. Ornament with berries." Aside from the atavistic measurements and Victorian era language, pretty much what one should expect from a real Whiskey Sour. On the same page, Thomas also lists recipes for the Gin Sour, Santa Cruz Sour and the Brandy Sour. If you're a fan of sours, you need to take another look at this neglected but honorable cocktail of a bygone era but make sure you do so with a good whiskey, fresh lemon juice with real sugar and - please - leave the sour mixes to gather dust on the store shelf. Add the whiskey, lemon juice and simple syrup to an ice filled cocktail shaker. Strain over ice into a rocks glass or straight up into a coupe or cocktail glass. Garnish with the orange slice and a REAL Maraschino cherry. BOSTON SOUR - add some egg white. NEW YORK SOUR - float 1/4 Oz. Red Wine. AMARETTO SOUR - Amaretto replaces the whiskey. SANTA CRUZ SOUR - replace the whiskey with Rum. * Traditional recipes call for "gomme" syrup which is simple syrup with gum arabic added to keep the sugar from crystallizing. Not necessary if you prepare fresh simple syrup properly and use it frequently. The gum arabic also added some body but that can easily be introduced by adding an egg white which will also add a lovely foam top. Of course, technically you are then drinking the above mentioned Boston Sour. 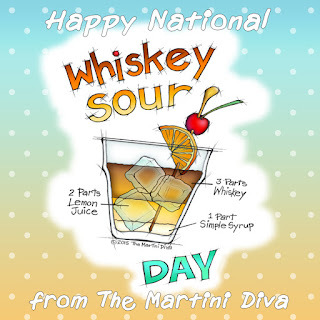 National Whiskey Sour Day is celebrated every August 25th.